I am a programmer and have been for 40+ years. I'm not just that of course. I'm a husband, parent of two daughters, a motorcycle rider and I enjoy films. But through the many changes in my life, the joy of the act of getting a program to work still is as thrilling as when my first program worked. The act of thinking about a solution, working out how to express that in a computer language and then making sure it is correct is time consuming and at times difficult, but is almost always rewarding in a way that is hard to explain to non-programmers. The problem is that this process is addicting. If you are working on a large program, you have to pace yourself. Break down the problem into smaller problems, solve those problems, assure yourself that they are correct and then at the end get them to all work together. You may test the solutions to these sub-problems, and trust that they will work together at the end. But at the end, there are always "integration issues" that were not thought about and take time to work out. This integration process is the most exciting and the most frustrating part of the process. And it is where the disease is really noticed. You try to get the program to do something and it almost works. Then you have to track down where it went wrong. This can be a time consuming task and requires that you know what intermediate results should be. If you are lucky, your code has enough comments and internal documentation to remind you of what various parts are suppose to do. During this process, concentration is required to hold all this information in your head. Anything that distracts you from this process takes time to recover from. Time doesn't so much slow down as it gets ignored. This is where the addiction becomes apparent to your friends, family and colleagues. You miss meetings, you skip meals, you come home hours after you told your wife you were just turning off the computer. You become unreliable and get irritated by anything that takes you away from your program. In short, you act like an addict. John Kemeny was the first one to point this condition out to me in the mid-1980s. Earlier in his career, he had worked on the Manhattan project doing calculations for Richard Feynman. He went on to be Einstein's assistant, invented the programming language BASIC with Tom Kurtz and became President of Dartmouth College. But he, too, suffered from this addiction to programming. Actually, I don't think he suffered as much as the people around him suffered. He could work really long hours even in his 60s. John wrote the first BASIC compiler and it is well known that it compiled its first program early in the morning of May 1, 1964. Here is an example of how exciting and time consuming things can be during integration. 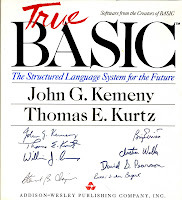 When we were creating True Basic, we developed a language system with an integrated development environment consisting of a compiler, a UI and an interpreter. Everything except the interpreter was written in Basic, and the interpreter was written initially in C and later in assembler on the machines it ran on. The compiler emitted code for an ideal "Basic" machine. I wrote the initial C interpreter and then re-wrote it in assembler for the actual product. This allowed the compiler writer and the UI writer to make progress while I worked out making the interpreter as fast as possible. The language was fairly large, but only a small subset of the language was needed to support the compiler and UI. I did this work first so we could debug the compiler and UI earlier in the process as well as getting actual feedback from users. It looked like we were close to getting things running natively on the IBM PC, so John decided to come by and help. In general, he could be a distraction. He would be nice and get pizza, but if he detected that we needed technical help, he would politely ask if we would like help. Of course, he was quite capable of helping, but being who we are, we enjoyed solving these problems. Things were going pretty well, but then I had to leave to catch a 6:30am plane to my grandmother's 90th birthday before things were quite running. At around 5:30am while packing, I get a phone call from John and David Pearson. They almost had it working but there was a problem with the character input routine where it masked off the lowest bit instead of the highest bit of any typed in character. This made it hard to type in programs and get them to run. They had found the problem in my code and were calling to see what the process was to assemble and link it. This was simple but time consuming on the IBM PC at the time; we only had floppy disks at the time and the assembler was slow. They made the fix and waited for the new interpreter. But they were, shall I say, a bit impatient. So, they figured out what commands they could use and what a simple program would be that would only use the even characters from the keyboard. They proudly told me later that it worked the first time somewhere around 6:00am in the morning. John was famous for his affection of his wife Jean, so I'm sure he didn't wake her up when he went home. But I'll bet you it was the first thing he spoke to her about after she did awaken. Wow, that is pretty cool and sounds like it was a lot of fun! You still need to get yoruself an RSS feed so I can subscribe to your blog and get new posts automatically!